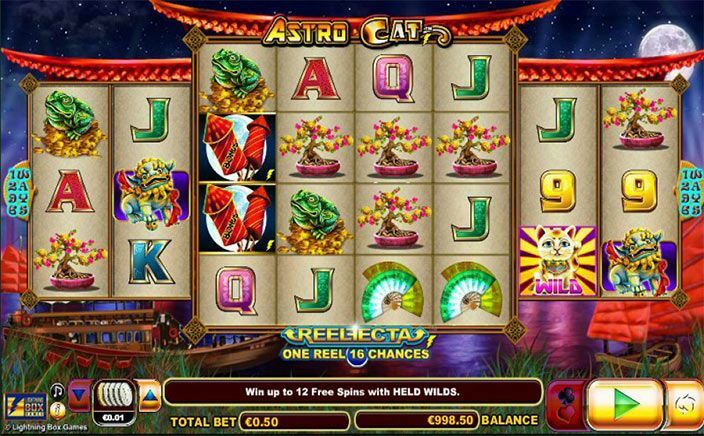 Come and visit the Asian themed slot game – Astro Cat which will really keep your mind rolling when the wild reels spin on your screens. The slot uses Reelfecta technology and may seem confusing to you at the first glance, but you will just not have enough of it once you start playing it. You will meet the cute-looking cat here dominating the reels when the ‘mega spin’ comes your way. The developer of Astro Cat slots game is Lightning Box Games which is into the casino software providing business since last 15 years. They are continuously developing software for both online and land-based casinos working on a math-based model. The team is highly technical and professional in their work and are always available to answer any player query at any point of time in the implementation process. Built over 3 reel sets side by side, Astro Cat slots brings to you a bonsai plant, firework, fan, goldfish, green frog and a dragon well laid on the reels. They are accompanied by the lower value symbols to fill those big reels. There are 1296 paylines which bring a huge likelihood of a winning combination. The Cat is the wild symbol and appears only on the middle reels and it can replace all other symbols except the fireworks symbol. There is no scatter. The bet is between 50p and £1,250 per spin. The bonus appears only on the side two reels, getting 5 of them will begin the Free Spins round for you. This will grant you 12 free spins. Just hope to not to visualise the poison symbol during the free spins as this might end the free play. However, the +1 wildcat symbol can get a free re-spin, with a sticky wild. How about that! One of the other special features is when you manage to fill the outer 12 positions with Wild Cats and you will gradually fill the inner positions too with fixed wilds. This creates 1 giant 16-symbol wild in the middle most reels. 1 Super Spin will be granted with the wilds being fixed to their place. The best thing is that you will not receive a poison symbol for the next 3 free spins for sure. There aren’t many elaborate features; all you will be waiting for is the free spins that might bring the super spin for you. The payouts are lovely and worth waiting for. 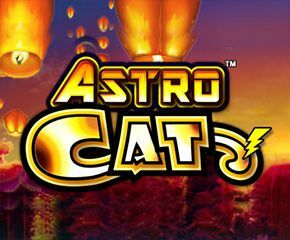 If you have a zest for Asian themed slot games, then you must visit Astro Cat slots. But beware of a highly uneventful gameplay.